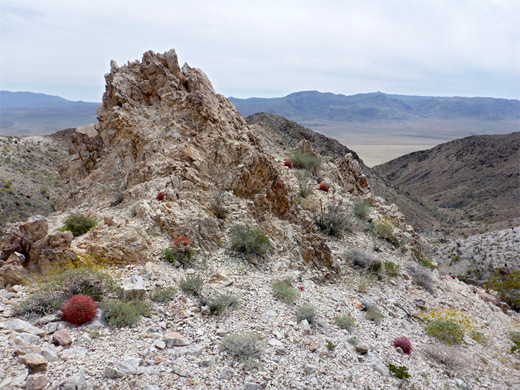 The rugged Pinto Mountains stretch 30 miles along the north side of Joshua Tree National Park, rising to a high point of 4,560 feet towards the northwest edge, near the main park entrance at Twentynine Palms. 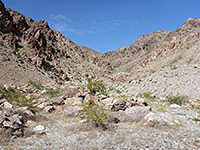 Some of the lower foothills are covered by Joshua trees though most of the slopes are rather barren; steep and rocky, formed of dark-colored metamorphic rocks, mainly gneiss, with the majority of the vegetation concentrated in the boulder-filled ravines that cut across the hillsides. One of the few designated hiking destinations is a 3,987 foot summit named just Pinto Mountain, a relatively isolated and prominent peak along the south side of the range, overlooking the vast, sandy flatlands of Pinto Basin; views from the top span an uninterrupted 360 degrees, as there are no higher points close by. 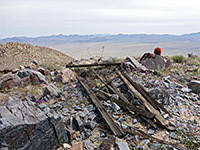 The shortest route to the top of the mountain is 4.5 miles, starting at a pull-out along Pinto Basin Road - over the plain for 2 miles, rising only briefly to cross a low, sandy hill, then crossing an alluvial fan and climbing a steepening, quite narrow ravine that leads to the base of a ridge near the peak; the last part is over more exposed slopes covered by loose boulders, leading to the flattish summit, which is marked by a trail register and some wooden debris. The log book suggests that only about one person per week makes the hike; the route is not signposted and apart from a short stretch towards the end there is no sign of a marked trail, yet the course is shown on some topographic maps, as are two alternative routes, longer but less steep. One of these starts from the same pullout and goes due north, before turning east approaching via a more gentle ravine, while the other branches off eastwards just after the sandy hill, later curving round a promontory and climbing via another drainage. All canyons hereabouts are usually dry, lacking any residual pools even after rainfall. 13 views of Pinto Mountain. Panorama from Pinto Mountain. Full screen version (22 mb). The hike begins from a gravel pull-out (Turkey Flats) along Pinto Basin Road, 6.2 miles east of the Cholla Cactus Garden. Three notices give information about the Pinto Basin area, and a map shows the three possible routes to the summit, though most of the few people who stop here just take a short walk across the surrounding flats, which are densely covered by creosote bushes. The peak is clearly visible to the northeast, as is the prominent ravine just below, lower end of which is just over 2 miles away. A faint trail heads a short distance into the desert then seems to fade away, but navigation is straightforward, walking cross-country over the firm, flat surface of coarse sand. Between the bushes, in springtime, are numerous tiny white flowers of cryptantha and chaenactis, plus occasional clusters of the much bigger Ajo lily. The land rises after a mile, up to a narrow, elongated sand dune ridge in the middle of Pinto Basin, where plants include brightly colored desert sand verbena, then slopes down again for another mile of the flats, up to the edge of the broad alluvial fan at the base of the canyon, just beyond a west-east trending dry wash. Another wash angles down from the canyon, the mouth of which is enclosed by low walls. 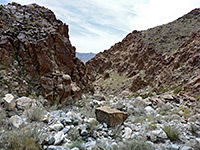 The streambed becomes rocky as it enters the edge of the mountains, lined by dark, twisted, banded metamorphic cliffs; the canyon gradually narrows and becomes steeper, curving through a few tight bends, ascending a big, sloping slab at one point, before the land opens out somewhat and the drainage is wider, and briefly less steep. The peak comes into view after a few more, wider bends, still 1,000 feet above. The drainage splits after 3.5 miles; the right (main) fork winds through rocks that are now mostly white in color, gaining height more quickly, and ending at the base of a ridge to the east. The final part of the route is up to the ridgeline, over sometimes loose and jagged rocks, then along a faint northwards path, past a false summit and on across bigger boulders to the actual high point, beside a large cairn. The top of the mountain has a different selection of wildflowers compared with the enclosed canyon, including phacelia, monkey flower and yellow dome, plus red-spined California barrel cactus. The views extend to San Gorgonio Mountain, 60 miles west.